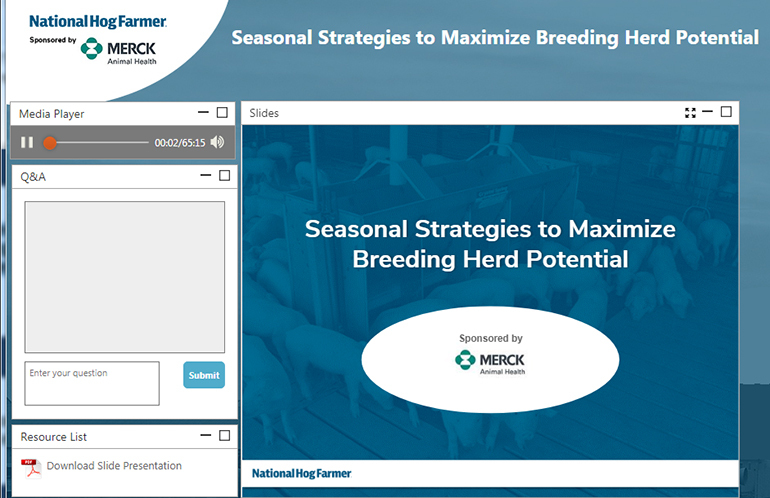 If you missed the “Seasonal Strategies to Maximize Breeding Herd Potential” webinar brought to you by Merck Animal Health and National Hog Farmer, or if you would like to tune in again, it is now available on demand for replay. Though summer is speeding by, there is still a lot of it left, and hog producers know the importance of keeping their livestock comfortable. Heat stress brings with it various production headaches producers need to contend with, and one of those is seasonal swine infertility challenges. Leveraging gilt potential and meeting breeding targets are keys to a well-run sow farm. In this webinar, Merck Animal Health’s James Lehman reviewed the sow reproductive cycle, and how commercially available products work to induce the heat cycle and synchronize estrus. He also discussed considerations for gilt and sow management practices and suggestions about when (and when not) to use therapies to maximize breeding herd performance. Leman, Merck Animal Health’s technical services veterinarian, provided webinar attendees with management options and strategies to help optimize their breeding herd’s performance now and throughout the year. Click here for a replay of the July 12 webinar.